An assembly of MásPúblico at the Patio Maravillas (Madrid). Photo Mónica Patxot. 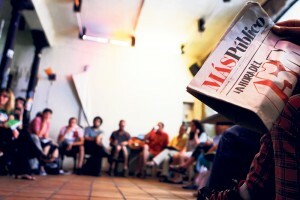 Editors’ note: Soon after its foundation in 2007, the newspaper Público became the most prominent progressive venue in Spain’s media landscape, standing out for its extensive coverage of new social movements such as 15-M, its unrestrained criticism of the monarchy and the political establishment–left and right–and its capacity to attract Spain’s strongest progressive voices. This spring, Público suspended its print edition, and a large part of the editorial team was fired. Almost immediately, a core group got together to found MásPúblico, a truly independent, cooperative media project. Berta del Río, one of MásPúblico’s leading young writers, gives us the inside story. (Versión en castellano.) Rumors were buzzing and the specter of closure hovered over the national Spanish newspaper Público when on January 3, 2012, the company’s shareholders announced they were filing for bankruptcy. Público’s last print issue appeared on February 24, five years after the paper was founded. It was the end of an era. A small group of employees from different departments decided they were not going let the paper go down without a fight. In fact, the paper’s personnel had begun to explore alternatives as soon as it became clear that Público’s print edition was doomed and that mass layoffs were imminent. Refusing to accept the decision of Público’s shareholders, they proposed taking over ownership of the paper themselves, avoiding both a shutdown and mass dismissals. “We proposed the creation of a cooperative of workers and users,” says Daniel Ayllón, one of the journalists involved. But the proposal fell on deaf ears. As it turned out, the shareholders had other plans for Público: Dismiss 85% of the labor force, but keep the brand going through a website run by a fraction of the original editorial team. This was not yet clear in February, when the paper’s employees were finally granted a direct meeting with the main shareholder of the publishing company, the Catalan leftist media mogul Jaume Roures. Confronting Roures in Madrid, Público’s nerve center, the employees demanded answers about their future and that of the paper. In a two-hour meeting, Roures insisted that Público was no longer cost-efficient, alleging that “he had already lost enough money.” Although he didn’t reveal any specific information about the paper’s immediate future, his message was reassuring. “If I were an employee of this company,” he stated, “I wouldn’t be worried.” What happened next is hard to believe, even today. Público’s owners and shareholders filed for bankruptcy protection, dismissed 85% of the labor force, and less than two months later… bought the newspaper again! As part of the bankruptcy procedure, one of the main assets remaining after the closure of the print edition—the masthead—was put up for public auction. At this auction, which took place on May 22, the paper’s former owners showed up disguised as a three-month-old real estate company, “Display Connectors.” Outbidding everyone, including the employees, the very same people who declared the newspaper bankrupt and laid off 130 employees without the normal legal compensation claiming a “lack of funds,” were someone able to gather 412,000 Euros, plus tax, to buy a website with 21 workers. “The hardest moment came when we realized that Roures had lied and that he would bid in the sale to buy the masthead. The whole plot was a scandal,” says Ayllón. Together with other former employees of Público, he came to the auction supported by 417 donors and a capital of 240,000 Euros, which they had raised in a single month through a crowd-funding website. The former workers lost the masthead—but they did not lose the support of the readers, and together decided to blaze a new trail in the history of Spanish mass media: an independent, cooperative media outlet that they fittingly baptized MásPúblico. In search of alternative models, they looked abroad. The journalist Thilo Schäfer traveled to Berlin to meet the people of Tageszeitung (better known as Taz), a German newspaper cooperative founded in 1979 and consolidated with the support of 11,800 members. “They are an example as a business model and because of their fresh and irreverent tone,” explains Thilo, for whom the existence of Taz shows that operating a media outlet independent from big corporations and without large advertising revenues is anything but a utopia. Two weeks later, the second issue of MásPúblico came out, signaling a slow but steady consolidation of the project. “We refused to be idle bystanders,” the issue’s editorial states. “The newspaper’s shareholders may have stopped believing in the project, but we never did.” (“Decidimos no quedarnos con los brazos cruzados. Quizá los accionistas de Público dejaron de creer en el diario, pero nosotros nunca lo hicimos.”) “Spain falls into Germany’s trap,” the issue’s headline read, featuring investigative pieces on ethical banks, the doubtful actions of large Spanish corporations in Africa and Latin America, miners’ protests, and the government’s massive cutbacks. Like the first issue, it was distributed free of charge, financed by readers through crowd funding. Presently, MásPúblico boasts more than 65 partners, a dozen workers, and an extensive network of contributors. In July alone, barely month after its launch, the paper’s blog drew 450,000 visitors. A fully-fledged website will be launched this fall, along with the third print issue. For now, MásPúblico will be a monthly; the goal is to appear on a weekly basis. The future of MásPúblico will be, like a child’s, one of growth and learning. The newspaper is deeply committed to its partners, subscribers and readers. Moreover, it faces the challenge of playing a crucial role in a historic time for Spain, reporting with boldness, engagement, independence and a positive spirit. Ultimately, the paper seeks to give voice to all the people who are silenced in the mainstream media. Berta del Río holds a BA in Publicity and Public Relations from the Universidad Jaume I de Castellón and an MA in journalism from Columbia University. She has worked for the newspaper Público and the Europa Press news agency. She is a founding member of the newspaper MásPúblico, where she currently works as an editor. For more information about joining the MásPúblico project, click here. This sounds like a wonderful opportunity for the people of Spain to speak their minds as they please. It reminds me of the Occupy Wall Street movement that occurred earlier this year. One sub-movement of Occupy Wall Street took place in Providence, Rhode Island. Participants there took the opportunity to make their voices heard and were both bold and positive in their quest for reform.